Available this year are the Red Initial Burlap Christmas Stockings to start or complete your family collection of Initial Christmas Stockings. Order yours early! 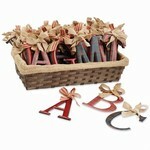 These Mud Pie Initial Christmas Stockings sell out fast.